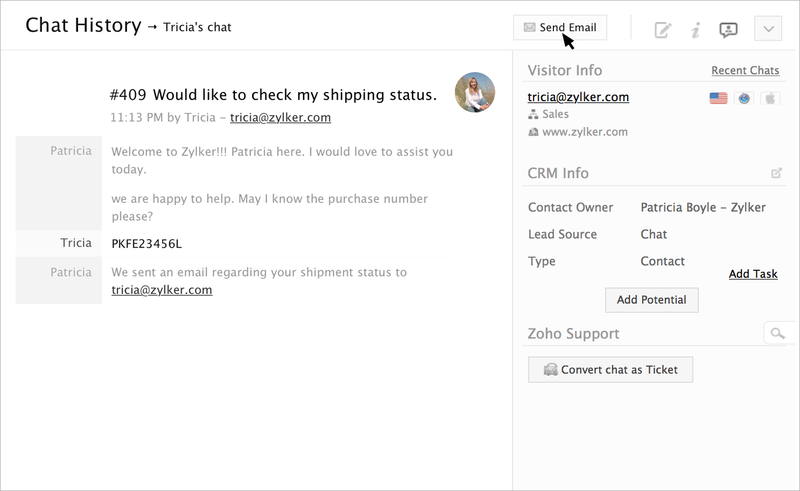 Through your Zoho SalesIQ’s Chat History view, accessible by clicking History in the left-hand navigation, you have access to the archives of all activity from your live chat customer support operation. 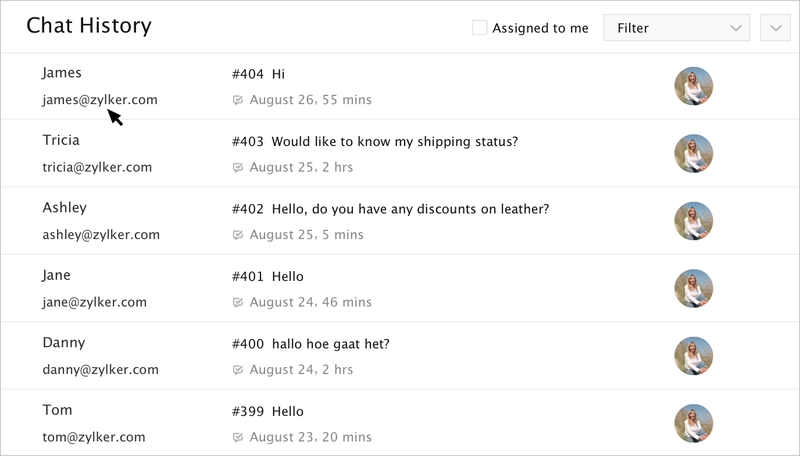 When you enter the History view, you will see the chats from your Zoho SalesIQ, the most recent displayed at the top, and going back in time as you scroll down. 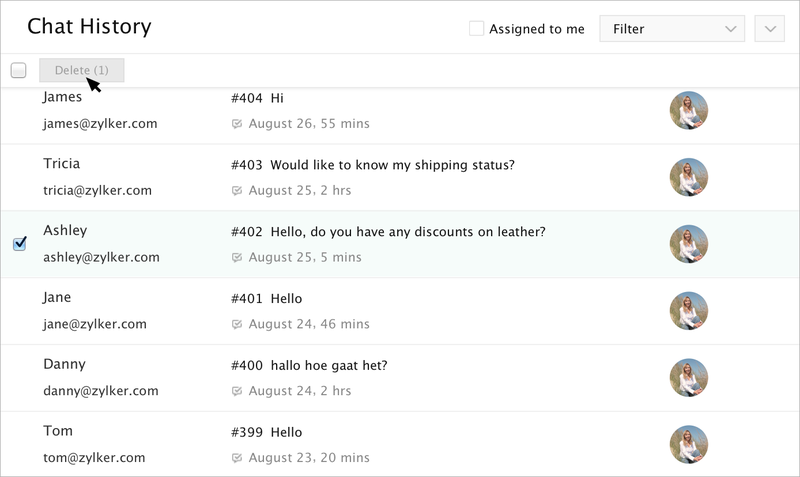 Each section displays the name and e-mail address of the visitor who started the chat, their question, and the time they submitted the chat along with the agent that attended their live chat offline request. You can filter how you view the chats from the Filter drop-down menu at the top-right, or click the box beside Assigned to Me, to quickly view your complete history. 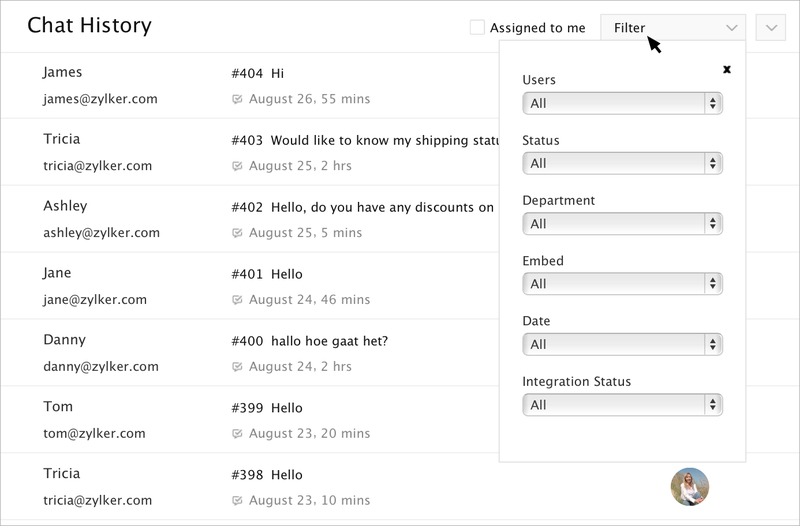 Filter the history by agent, status (closed, attended online, attended by e-mail address, or missed) department, embed or date. You can delete a specific record by hovering over the record, checking the box to the left of the visitor’s name that appears and then clicking the Delete button that appears in the top-left of the History view. To delete multiple records at once, you can follow the process of checking the box to the left of multiple records, and then clicking the Delete button. If you want to delete all records you have pulled up through a certain filter, check one box to the left of a record, and then check the box to the left of the Delete button—this will select all the records on the current view, the number of which it will display on the Delete button—and you can click Delete to clear them out of your system. To view the transcript of a particular record, click the record. In the transcript view you also have access through the icons at the top-right to the visitor’s information, and the notes section. If after reviewing the transcript you wish to send the visitor an e-mail, you can click the Reply button at the top-right, to bring up a compose message box where you can then send the message.